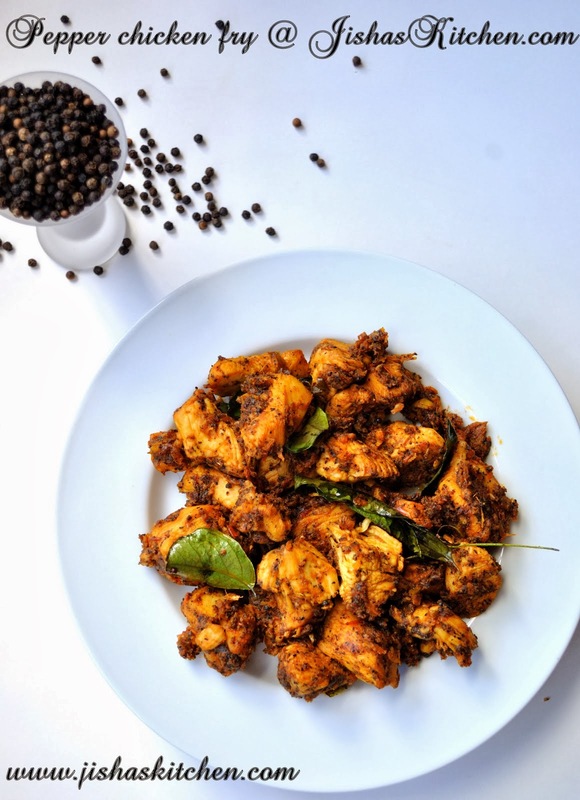 My today's recipe is Kerala style kaduku manga achar / Kerala mango pickle / Kadu manga achar. Pickles / Achaars can be made with a wide varieties of vegetables & fruits like lemon, mango, Indian gooseberry, apple, garlic, ginger, cucumber etc etc and even we can make non-vegetarian pickle using fish and meat but the mango pickle and lemon pickle are the most popular among them. After my marriage when I joined my husband in US, I bought around 4-5 bottles of both veg and non-veg home made pickles along with me. When it was almost over, my hubby told me to prepare home made pickle/achar but I felt it must be time consuming and a difficult task. That made me go for pickles from the grocery store but it never satisfied my taste buds. Meanwhile some of my readers asked me to share a mango pickle recipe and then I seriously thought of giving a try first and then decide if I have to wait till my next vacation to get some home made pickles or not. Believe me, when I finished making my first mango pickle, I was like "Ohh!, why I waited so long to prepare this, this was so easy" and even it was so delicious that I couldn't stop myself from licking my fingers. I was so excited about the success of my first home made pickle that I prepared 2-3 bottles of pickle in that week itself. I know that this is not the right time, to upload a mango pickle recipe because mostly we will get good varieties of raw mangoes only during summer season but you can prepare this even now if you are lucky enough to get some good mangoes. I guess I prepared this mango pickle, couple of months back, some time around the Onam season. First clean and dry the mangoes and then cut the mangoes to small pieces and you have to remove its seed and stem. Next add 2 1/2 tsp - 3 tsps of salt to the chopped mangoes and mix it nicely and keep it in an air tight container for around 2 hours. Then take 1/3 cup ( 1/4 cup+2 tbsp ) of water along with 4-5 tbsp of vinegar and bring it to a boil and then remove from the flame and allow it to cool. Next heat around 3 tbsps of oil and add mustard seeds and when it pops up, reduce the flame and add curry leaves & chopped garlic and saute for about 30 secs and then add red chilly powder, turmeric powder, fenugreek powder, asafoetida powder and fry for less than a minute. Next add vinegar-water mixture and boil it for around 4-5 minutes. Then add salted mangoes pieces and mix it nicely and keep it in a very low flame for around 2 minutes and then remove from the flame and allow it to cool. Then check the salt and add accordingly, and let the salt to be at a higher side. For storing the pickle, first transfer the pickle to a dry and clean air tight porcelain or glass container and keep it covered and undisturbed in a cool and dry place for around 2 days. After 2 days you can store the pickle bottle in the refrigerator. 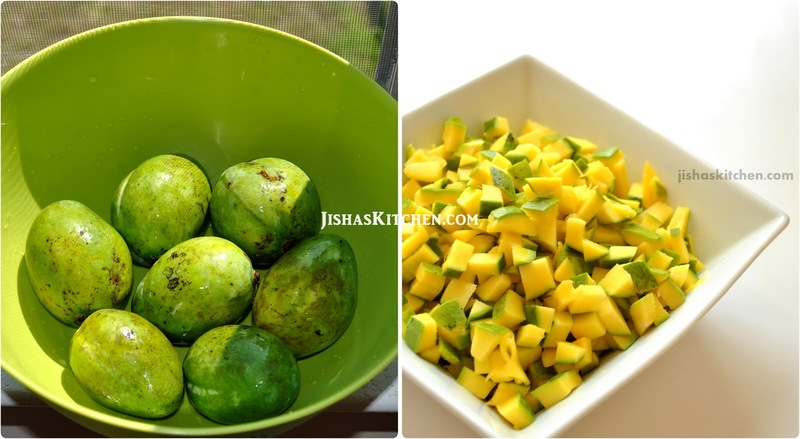 Keeping the pickle outside for around 2 days will make the mangoes soft and also helps the mangoes to get mixed well with the spices, but if want your mango pieces to be crispy, then I suggest you to keep it outside for just 4-5 hours and then transfer to the refrigerator. You can add salt depending upon your personal preference but remember the pickle with more salt is suppose to last longer than the pickle with less salt. Always use a dry and clean spoon to take pickle from the container. Never ever put your finger or a wet spoon in the pickle and always close the container tightly after use. Delicious mango pickle..lovely combo with kanji or plain rice..Perfectly done,dear!! Pickle looks delicious and easy to make.. thanks for sharing..
Hey Jisha...veruthe manga kittathe kallathu nunappicho ketto....;) Achar adipoli...clicksum super..
achar is so tempting and mouthwatering !! Beautiful clicks !! Delicious mango pickle,nice combination and mouthwatering presentation. 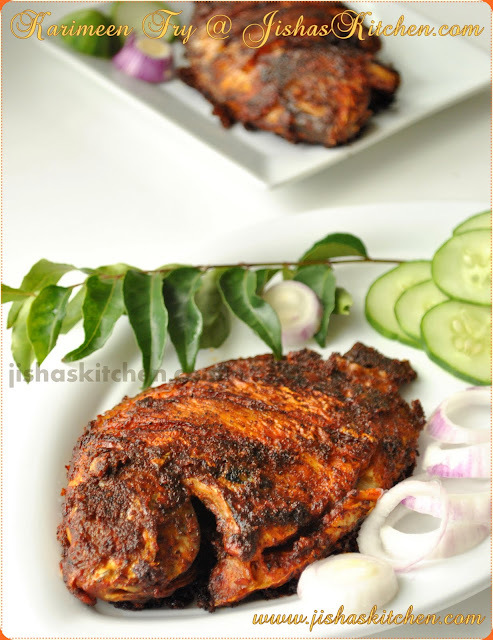 Spicy and drool worthy,achar is mind blowing,wish I could taste this right now..superb clicks Jisha. My fav pickle. Nice tips and nice explanation. I love it totally! looks very tempting and mouthwatering !! Beautiful clicks !! Very easy to make and I am sure it tastes good as well. Wow lovely pickle.... Can eat it just like that.... Mmmmm drooling here. I love your yummy recipe, thank you so much I found your site I have something new to try with.. wow....I just love pickles ....this one is quiet innovative....will giv it a try sometimes ! that sure looks delicious. i love it.